Ribbon: Yellow with light blue edge stripes. The Medals have a yellow ribbon with 3 light blue stripes. 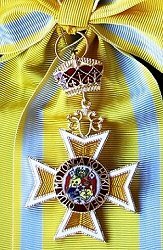 Instituted: 2009, replacing the Royal Order of King George Tupou I. Awarded: For exceptional services to the crown. Grades: 5 (Grand Cross, Grand Officer, Commander, Officer and Member) plus Gold, Silver and Bronze Medals.